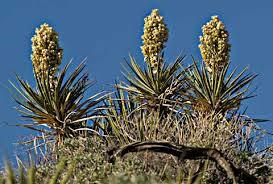 As you drive from the west on Interstate 8 and turn up Sunrise Highway, you can’t miss the beautiful yucca in bloom in the early spring. 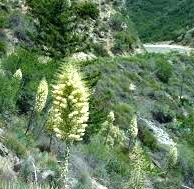 The tall plant with the creamy blossoms is commonly known as chaparral yucca, Our Lord’s candle or sometimes Spanish bayonet. These common names can be confusing, as there is an entirely different yucca also called Spanish bayonet. The plant with the basal rosette of sharp leaves and the single flowering stalk is actually Hesperoyucca whipplei. It used to be called Yucca whipplei until DNA analysis found that it is a slightly different species than Yucca. The chaparral yucca only blooms once, then dies. The other Yucca you may see is Mojave yucca or Yucca schidigera. This is a true yucca. It also carries the common name of Spanish bayonet or Spanish dagger. Mojave yucca has a different growth habit from the chaparral yucca. A trunk forms and as leaves die in the rosette, they fall and cover the trunk. The beautiful blooms are a combination of cream and bronze colors. This yucca blooms more than once, differentiating it from the chaparral yucca. Both the chaparral yucca and the Mojave yucca grow over a wide range, from coastal San Diego well into the desert. In fact, Mojave yucca is farmed in Mexico for pharmaceutical preparations and other uses. One of its uses is as the foam in root beer. This is because yuccas are extremely high in saponins, a soapy, detergent-like substance. Native peoples used every part of the yucca plant. The roots were used to make soap and poultices to treat skin conditions, the flower stalks could be cooked and eaten, and the hearts were harvested and baked in underground stone ovens. Fibers from the leaves were used as cordage and for sewing. The leaves were also used to make sandals. All the yuccas and the agaves are related. Botanists have a habit of regularly reclassifying plants based on new findings. Yuccas are as part of the lily family and the agave family. Most recently, both agave and yucca were placed in the asparagus family. It’s actually not too hard to imagine the chaparral yucca in bloom as one great big spear of asparagus.